Judy Juanita, De Facto Feminism: Essays Straight Outta Oakland. EquiDistance Press, 2016. Pp 226. ISBN 978-0-9716352-1-0. $19.95. 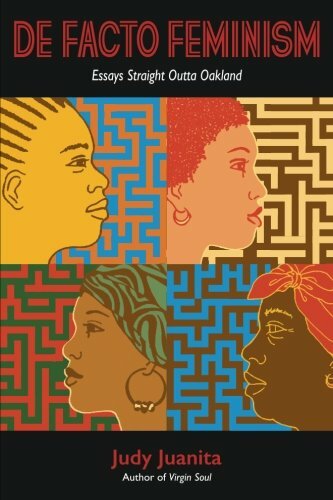 Judy Juanita’s collection of essays De Facto Feminism: Essays Straight Outta Oakland is a mixture of previously published material from her long career in activism, including poetry, and more recent autobiographical reminiscences that relate to her 2013 novel Virgin Soul. This work does not relate to genre per se (unless we think of being Black in America today as being a dystopian experience, which, to be honest, we might well do). The sixteen essays, half dozen poems, and a collection of digital correspondence span from 1967 to 2015, much of which is drawn from the online magazine The Weeklings, cover expansive territory on Juanita’s career as an activist and an artist: she has been a member of the Black Panther Party, has taught in the first Black Studies program in the US, and is a playwright, poet, novelist and professor. She reminds us that creative work is activism too. The earliest pieces in the volume, like ‘My California Childhood—a freedom childhood,’ ‘White Out,’ ‘Five Comrades in The Black Panther Party, 1967-1970,’ and ‘Black Womanhood #1’ revolve around Juanita’s coming of age in Oakland in the 1950s and 1960s, her time as a student and then teacher and activist, and how each identity informs the other. In ‘Black Womanhood #1’ she writes, “The black woman has her own turbulent and dialectical process of self-transforming. I know because I’m living it every day” (51). Though those words were originally written in 1967, they are still true now, for the author and millions of other women today. The following essay, ‘Tough Luck,’ focuses on another form of identity, with the author as poet. Juanita incorporates the text of several of her poems published during the period into the body of the memoir, demonstrating how she used her poetry and art to come to grips with her divorce and motherhood, and how these topics both bridged and separated her from the community of poets she was a part of. ‘Cleaning Other People’s Houses’ also utilizes a poem written during the period, when Juanita joins a friend’s cleaning business for a brief period. She does the work for extra cash and for the experience of having done so, to the horror of friends and colleagues. Cleaning other people’s homes is a voyeuristic experience: she sees a book about AIDS on a nightstand, followed by other books, followed by the revelation that one of the men she’s working for has been diagnosed with the disease. Another time she is semi-forced into another kind of labor when the matron of the house finishes reading Alice Walker’s The Color Purple and wants to discuss it with Juanita; she dryly notes that Walker championed Zora Neale Hurston, another Black novelist who worked in domestic labor to make ends meet. ‘A Playwright-in-progress’ describes her experiences in a series of writing workshops, trying to nail down exactly what she does want to write even as she faces the often unrelenting whiteness of most workshop and fellowship programs (a topic that author Junot Diaz has also written about, rather scathingly), while ‘Putting the Funny in the Novel’ recounts an ironic encounter with an editor who wants more humor in her experiences as a black woman and a Black Panther. Juanita turns to literary criticism as well as reminiscence in ‘The N-word: Let’s not throw out the baby with the bathwater.’ She discusses the multivariated uses the word takes on in August Wilson’s Pulitzer Prize-winning play Fences (1987), cruel and affectionate, abusive and matter-of-fact. She also discusses the discomfort her students feel when they discuss the word, and the play, in class, and the discomfort she herself feels when the word is inflected differently by Black, white, and Asian students. She feels a discomfort about the divide between literary and genre fiction in ‘All the Women in My Family Read Terry Macmillan.’ Macmillan’s most famous novel is Waiting to Exhale (1992), a book that heralded a phenomenon of “black chick lit” that Juanita thinks has overtaken African-American literary fiction, and thus complicating the struggles of Black women writers like herself. The Gun was the shatterer of the boundary between the personal and the political. I liked guns. They were talismanic and palm-friendly… The Gun is a revolt of the mind, an expulsion of hatred and thus a cleansing agent. Once it is fired, the act done, the two opposites are united forever, the killer and the killed written into history, memorialized or castigated. Taking up literal arms was how the Black Panther Party stood in opposition to the Black Arts Movement, but over time those guns became increasingly metaphorical instead. The “performance” of The Gun, Juanita argues, has taken over America in schools, theaters, and on the street. She concludes, “I liked guns. I hate The Gun” (115). The final entry in the book is entitled ‘Acknowledge Me’ and consists of a series of emails with a colleague regarding the death of their mutual friend Peter Thorpe, a fellow playwright and mentor. The correspondence includes poems, imagined dialogues with Peter, discussions on works-in-progress, and ultimately coming to terms with grief. Most of the emails are dated from 2007, with a single entry in 2008, and then a rhapsodic conclusion in 2011 when the author’s novel is sold to Viking: “I’M A NOVELIST, I’M A NOVELIST, I’M A NOVELIST.” That shift from the literary form of writing—essays to fiction—reiterates a shift in identity as well, one that closes the book and, seemingly, provides a sense of closure for its author. De Facto Feminism: Essays Straight Outta Oakland is a thought-provoking collection, one that should be read and taught alongside such classics as Bulkin, Pratt, and Smith’s 1984 Yours in Struggle: Three Feminist Perspectives on Anti-Semitism and Racism, Alice Walker’s 1998 Anything We Love Can Be Saved: A Writer’s Activism, and Patricia Hill Collins’s 2008 Black Feminist Thought: Knowledge, Consciousness, and the Politics of Empowerment. Though the book was prepared for print and published prior to Trump’s election in the US and the Resistance movement that has followed, its appearance when so many American readers and writers are struggling with how to incorporate political activism into their work makes the book incredibly timely and necessary. Art is survival, too.